James Patrick Holding examines L. Ray Smith’s teachings on eternal punishment. This is actually one of the first debates that I have ever had via email. I was searching the internet one day when I came across a web site called “Bible-Truths.com” I decided to check it out and read what the man had to say, and I was disgusted. Almost everything this guy said was in complete contradiction with the scripture although he used hundreds of scriptures to support his claims. Me being the optimist that I was decided to write the man a letter of correction in hopes that he would see the truth and change his teaching. How naive was I? In any event, this is what came from it. Notice that even those who have their own web sites, are much older, and study very long periods of time, still commit all the same errors that your average cultists do. The man misrepresents what I have actually said and then argues the false argument that he has created for me. Plus all his study hasn’t helped his spelling either. Mr. Smith will be blue and I will be red. Compare everything to the Word of God and decide who agrees. Official website of L. Ray Smith. Also at BibleTruths.com. The first article listed on Smith’s website – last reviewed Jan. 23, 2007 – is titled, “You Fools! You Hypocrites! 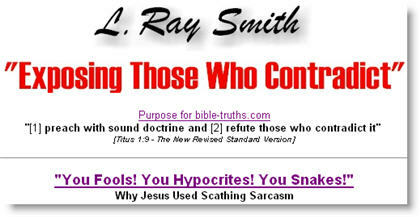 You Snakes!” Why Jesus Used Scathing Sarcasm. After reviewing the rest of the website we think it could be meant as apologetic for the tone used by Smith in many of his writings.